Many people are concerned about the quality of their drinking water. These people often turn to bottled water when they feel their own tap water is unsafe to consume. A growing number of consumers are looking into home water filtration to insure their water is safe to drink and reduce their carbon foot print. Water filters are a good option over bottled water. 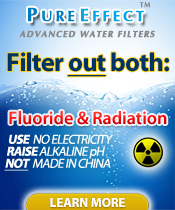 Just make an informed descision when choosing a water filter for your home. Not every home water filtration systems are the same. There are literally thousands of home water fitration systems on the market today. Before making a purchase, it is important to know what filter is right for your clean water needs. The most important thing to look for in a drinking water system is how well they perform and do what the manufactures claims they will do. Let’s clear up some confusion so that you become an informed consumer and make the right purchase for your water safety. There are industry standards that water filtering systems must adhear to. Knowing about these standards will help you make the right purchase. Since the enactment of the Safe Drinking Water Act over thirty years ago, most Americans simply assume their water is safe. The reality is most drinking water is contaminated. The U.S. Environmental Protection Agency (EPA) does monitor the quality of drinking water, but their standards lack on many levels. They actually allow certain contaminants into our water supply at what they refer to as “safe levels.” Many of these allowed contaminants are not safe at all, at any level. Public water companies are required to report via a “consumer-confidence report” regarding the contaminants in their drinking water. These reports are required to be public. If there are contaminants that have no EPA standard, the water companies do not have to include those contaminants on their report. While a report may show that there are safe levels of contaminants, there may be spikes in certain ones, this does not appear on the report. The report contains an average of several annual tests and this may not accurately reflect the level of contamination. The testing of the water occurs at the facility, not at your faucet. The water that is deemed safe has to travel a long way to get to the faucet in your home. During its travels to your sink, many other contaminants like lead, asbestos and more easily get into the water. While the EPA is entrusted with the safety of our drinking water, it has no control of the water treatment industry. Consumers who want to know about water treatment devices and filters look to NSF International for ratings and regulation of water filtration devices. NSF is an independent, non-profit organization that tests consumer products, including water filtration systems to insure they remove or reduce the contaminants that they claim to remove or reduce. The NSF seal is one thing to look for on any home water filtration system. Some states have their own requirements for the health claims of drinking water systems. California, Colorado, Iowa, Massachusetts and Wisconsin have regulation in place for drinking water filter systems.